According to all weather sources, another brutal winter is in store for cold-weather states in the U.S. That’s great news for everyone that makes money pushing snow and melting ice – there’s money to be made out there, that’s for sure! It’s important to start here because as you research your plow options, you will find a wide range of products at different prices. How different can they be – right? But beware – because a plow looks good sitting in the retail sales floor does not necessarily mean it will perform and last in the long run. It’s important to remember that phrase – “the long run”. If you step up to a quality plow, which may cost you more upfront, you can expect that the plow will last you for nearly a decade (depending on how severely you use it). Most plows of lesser quality simply will not last that long, and to compound the problem, you’ll quickly lose all the savings you thought you realized and the point of purchase by having to constantly replace broken parts. Not only will the parts cost you money, but the downtime without your plow will cost you even more – as those contracts you had for snow removal will quickly abandon ship and find someone to replace you – and just like that – your income stream is interrupted. When we speak to professional plowers about their business, this is the #1 regret they all have – not investing in a quality product in the beginning. Think about it, when was the last time you regretted buying something of high quality? Now, let me ask, when was the last time you regretted buying something because it was cheaper than the better products? Are you thinking about contracted snow removal of big parking lots, side roads, long rural driveways? You are going to want a larger plow - nothing less than 8’ in width – and you should seriously consider a V-plow – which provide quicker and more efficient snow moving capabilities than a straight blade. Are you a homeowner that has a long driveway that you want to clear, but don’t plan on doing commercial work? 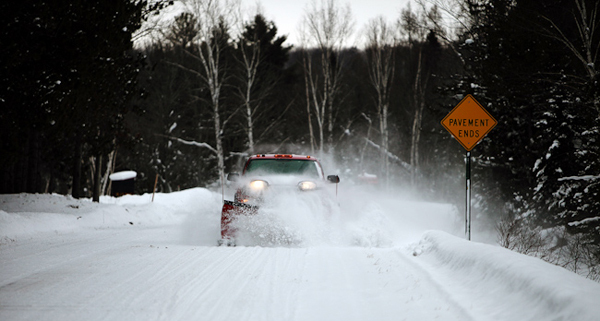 You will be more than happy with a 7’ or 8’ plow – and V or straight blade plow will work. If you own a UTV, consider a v-plow for it as well – as the UTV’s plowing capability, when matched with quality UTV snowplow can move snow nearly as efficiently as a smaller pickup truck. If you are going to do commercial plowing work, you will want nothing less than a ¾ ton pickup truck. They have the Front Gross Axle Weight Rating (FGAWR) to handle the larger plows that are available, and chances are, you’ll need that larger truck’s payload capacity to outfit the truck with a salt/sand spreader too – after all, commercial contracts will always require ice control as well – and to be considered for the job, you’ll need the equipment. If you are plowing a driveway, most ½ ton pickups will do the job just fine, and in some cases, even smaller pickups will work. As was previously stated, if you own a UTV, it will do a great job on driveways with a good plow on it as well. In short, either plow design will get work done. Straight blade snowplows are still a big seller as they tend to cost a bit less than V plows. But the V-plow does have the ability to angle and direct snow – as well as “scoop” snow for stacking that straight blades simply can’t do. The v-plow also handles snow that has “frozen” overnight better than a straight blade – when put into the “V” position, the plow’s arrowhead configuration can slice through hard snow better than the flat surface of a straight blade. That slicing action also makes the operation easier on the vehicle and the operator. I can’t stress the importance of a having good relationship with your dealer enough. Snowplows operate in a tough environment and as such, things happen. You will need parts or service at some point in time. This relationship usually begins in the purchasing process – and too often, folks make the mistake of price shopping dealers against each other, or, buying the plow on-line from a distant source and then expect their local dealer to fix the product immediately if something goes wrong. Trust me, the couple of hundreds of dollars you saved buying it elsewhere will not be worth it the long run – after all, your plow should last you for years – and having that relationship with a nearby dealer will make your service trips much easier! Do you have an idea of how much you want to spend on a plow? $3,000, $4,000, $6,000? If you’re looking at commercial grade products, the v-plows will be in the $6,000 range new, with straight blades being slightly less – again all depending on the models. For the homeowner – products will range in the $3-$4,500 range. Of course it’s always great to buy new products, but the reality is that often buying good used product makes more sense, especially if you’re just starting a business from square one. Used plows are often available at good snowplow dealers, and this is really where building a relationship with a local plow retailer will pay off. They will ensure that the used product you are considering has been thoroughly inspected and that any parts which need replacement – will be replaced. When looking at a used plow – look for obvious signs of abuse – bent blades or beams, broken welds, etc. Paint chipping and scratches are normal, and can be “touched-up”. You’re looking for damage to the major components here – and when you see them, they will be obvious. Remember, thick, heavy steel does not bend on its own, in some mysterious manner – if it’s bent, the previous owner hit something – it’s that simple! Don’t overlook the attachment system of the plows you’re considering. You’ll need to attach the plow in the worst of conditions, dark, cold, ice, wind, salt, grime – it’s all part of the winter environment! Don’t buy into the hype of the “fastest” attachment systems, instead focus those that tout “ease” of attachment. There’s a big difference. On the commercial plow side: All three materials will do the job for you, but each has its own strengths and weaknesses. Poly is the slickest material of the three, as such, snow will not stick to the blade and will slide off the blade further and faster than it will with the other materials – as such, it is becoming the choice of more and more professionals out there. It is also extremely corrosion resistant and scratch resistant. Stainless Steel has visual appeal and corrosion resistance and perhaps a slight advantage in “slickness” versus mild steel, but it is also prone to denting – any rocks you hit will leave “dings” and over the course of time, this will become unsightly and may affect the plow’s performance. Mild steel has been used to manufacture plows for decades. This workhorse proves durability, rigidity and excellent value. One common myth to dispel: Poly plows are not lighter than their steel counterparts. In fact, they are usually heavier. Why? Because the poly material lacks the rigidity of steel, it must be “backed” or reinforced with even more steel in order to keeps it shape. As such – poly plows are commonly heavier than steel plows. Lighting is one of the most important elements of a good plow product. Visibility during big snow events is often terrible with darkness, snow, blowing and drifting snow all parts of the plowing environment. You simply cannot overvalue good lighting – like a high-output, dual burn system. It’s also important to consider the mounting system for plow headlights. Many manufacturers use a dual-stud design which are prone to loosening and moving while plowing, a source of great frustration for those who have to operate them! Look for a headlight systems which uses a two-piece “clamp” design, which will keep the headlights in place. The only real interface you’ll have with your snowplow will be via the controller. Every manufacturer offers options for controllers like joysticks, an old traditional standby, or the touchpad controllers, with a keypad that features buttons which quickly position the plow in any way you want. Some manufacturer’s keypads controllers have 8 or more buttons – which can make them difficult to learn and use, especially for a beginner or someone with large hands. Again, ease of use is important for a snowplow, so look at the controllers with fewer, large buttons for easier use and learning. There are more considerations when it comes to purchasing a plow, but this is a great starting list. Visit plowing on-line forums or Facebook pages of the plow brands to learn more. Contact BOSS Snowplows at any time to ask questions – www.bossplow.com.